Few people have to suffer the heartbreak of burying more than one relative at a time. So, it is hard to imagine what it must be like to have three of your own family taken at once. 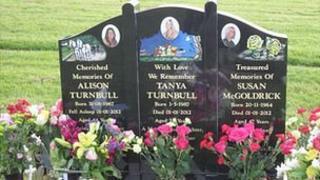 Susan McGoldrick, her sister Alison Turnbull, and Alison's daughter Tanya were all shot dead on New Year's day, 2012. Susan's partner Michael Atherton was described by locals as a quiet, friendly taxi-driver. The family knew different. He would come home drunk and launch violent attacks on Susan. Durham Police knew this, as they had been called out to the house on more than one occasion. Despite that he was granted a licence to hold guns. Six in all. A yet-to-be published report by the Independent Police Complaints Commission reveals that the police missed many opportunities to rescind the licence. The examination into the way the firearms licensing unit was run is damning. Despite finding individual officer actions 'unacceptable', the report does not name names and it seems no one will be held directly accountable. Durham Constabulary says the report is right not to identify the individuals concerned publicly, and that procedures and policies have since changed. The family's concerns over the way guns are administered has given them a focus. This summer Inside Out filmed them when they addressed a meeting of the National Victims' Association. It is an organisation no-one would ever wish to join. By definition its members are united in tragedy. What it provides is support and the knowledge that others have a real understanding of what you're going through. Susan McGoldrick's partner Michael Atherton shot her, her sister and niece before turning the gun on himself. The family's account of the day of shootings is harrowing. However, with the killer dead revenge is obviously not on their agenda. What they want is a change in the gun laws. They have launched an e-petition. Among their demands is an outright ban on anyone with a criminal record, a history of mental illness, domestic violence, alcohol or substance abuse owning a gun. If you have an opinion then please feel free to add your comments to this blog.